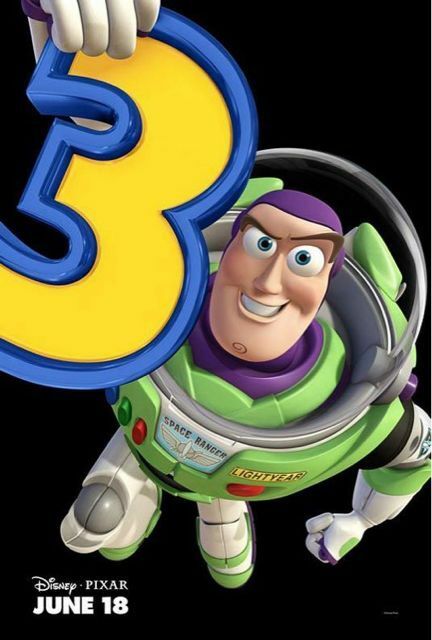 I’ll start by saying I haven’t watched Toy Story 2 recently enough to do the Pixar rankings everyone likes to do. In Toy Story (1995), we met Woody, Buzz and the gang, and Toy Story 2 (1999) was a rescue Woody/Buzz Lightyear’s father story. They are all stories of friendship, loyalty and one’s place in a world of humans who don’t always maintain these traits. True to form, Toy Story 3 is a continuation of these themes. The movie is essentially answering the question of how different types of toys deal with their prime directive of be-played-with-and-make-their-owner-happy as times and people change. So anyway, since the last movie ended Woody, Buzz and Co. have been concocting schemes to get now college-aged Andy to play with them. For example, they steal Andy’s phone and put it in their toy box so that when he calls it, they’re right there. While cleaning and storing for college, Andy’s mom accidentally puts the toys on the curb for trash collection. They eventually end up in a box bound for daycare, believing Andy abandoned them even though he actually intended to put them in the attic for safe keeping. At this point, the plot is set in motion as their eventual conflict with Lot-so-Huggin’ bear is set up. Lot-so is the don of Sunnyside, a repository for older, once loved toys. At Sunnyside, toys fulfill their earthly wish for playtime. The rub is, Lot-so runs the place and puts newcomers with the 3 year olds in the Caterpillar Room. The Caterpillar Room is the AAA affiliate of Lot-so’s room of older, gentler children. When you first arrive, you’re put it in there and you can basically expect to get beaten up everyday. Whoever plays the game and survives Caterpillar gets called up. Once in the other room, one can expect to live out a sweet life with the elite. When the not so savory parts of Lot-so’s operation come to light, the gang needs to act. 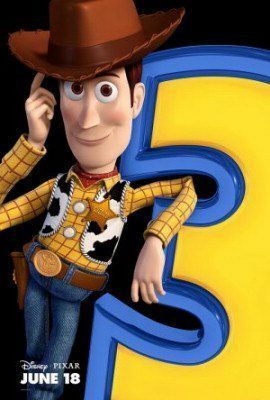 In my opinion, the movie is another success for Pixar. It has the heart, but isn’t the least bit heavy handed sentimental, which it easily could’ve been. The introduction from the director before the movie talks about he made this movie with individuals my age in mind. I was 6 when this movie came out and it was one of, if not the first, movies I saw in theatres. His thesis was that Andy and the college students in the audience had almost parallel trajectories. Marketing gimmick? Maybe. I don’t much care because it is effective in enhancing how I frame the movie. It continues the Pixar tradition of making kid’s movies that don’t feel like kid’s movies. The best part about the movie is that it assumes its audience has a connection to these characters and the universe they live in, thereby needing no introductory fluff. Standouts moments from the story include the opening train heist scene between Woody and Potato-head, the Sunnyside henchmen and factory reset Buzz. Truly, the only gripe I had was a small one with the introduction of Ken, of Barbie fame. By any normal standard he’s a funny minor character and he works in the context of the movie, but I couldn’t help thinking that he was a bit Dreamworksian. I could see Ken in Shrek. If that’s my only problem with the movie I’m guessing I’ll call it a win. Randy Newman music is obviously present but only in “Friend In Me” form. I guess it goes without saying that the animation in TS3 is fantastic and I can only imagine how much better the eventual 3D release will be. I didn’t notice any moments in the movie that were built for a pop-out 3D moment so I can assume that it will be well integrated into the movie. But wait, Shawn, doesn’t any self-respecting reviewer always criticize endings? Well, the cut of the movie I saw was called the Cliffhanger Edition because they apparently weren’t done mixing the movie. I saw 70 of a possible 85 some minutes. Therefore, the movie cut to black right before the grand mission was about to jump off so I really can’t say whether they succeed in emancipating themselves from Sunnyside. I can, however, with my history of cinematic analysis, project the most likely ending. Lot-so sees the writing on the wall and assembles all of his cronies to stop the exodus. Upon seeing Woody leading the charge, he pulls out his sword. Woody enters a Mecha and catches the sword just as it swings toward his head. Lot-so isn’t sure what to do, so he shoots his grapple and we’re led to believe he’s gone. Of course you were led to believe that, but the problem is that he jumps back into frame and is Robo-cop. Woody, knowing he needs to finish Robo-Lotso off before the place explodes, runs toward the top deck of the ship. He climbs the mast and drops a moon-rock on Lot-so. There’s lots of smashed toy blood. The end. I should start out by acknowledging the fact that it’s probably inappropriate for me to review Circa Survive’s Blue Sky Noise. I’m undeniably biased when it comes to Circa Survive. Many moons ago Anthony was in a band called Audience of One and Colin was in a band call This Day Forward, both of which released a record on a label that I was associated with at the time. I constantly root for them both to succeed. Having said that, as good as their first two full lengths were, those songs just weren’t what I was looking for from these guys. Anthony Green is a chameleon. His voice sounds completely different on each of the projects of which he’s been a part. So I really shouldn’t have been surprised that on the first two Circa Survive records he didn’t sound like the singer of Saosin, but that’s not what I wanted from him either. I wanted the Anthony Green who sang on the first Zolof the Rock and Roll Destroyer record to sing over heavier music. The first time I heard “Get Out” off of Blue Sky Noise, it was like the Circa Survive I heard in my head had finally become real. 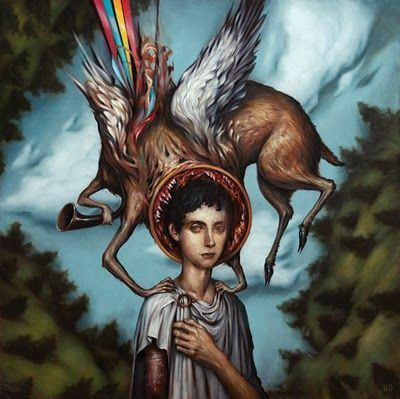 Circa Survive have crafted an interesting sound for themselves ranging from spacey prog to driving punk inspired rock. Anthony Green never takes the easy road with his vocal and lyrical phrasing which offers many unexpected treats. The record hits it’s strongest moments when Anthony’s highest vocals give way to intense screams over top of dueling guitars and driving beats. If there’s anything to complain about it’s that the record is long. I’ve rarely made it all the way through the final tracks of the album. This may have more to do with how enjoyable the first six or seven songs are than demonstrate a lack of quality in the last few tracks. The deluxe version of Blue Sky Noise features a few bonus semi-acoustic/reimagined versions of songs off the album. It’s interesting how different they feel. These versions remind me of the mid-90s Layne Staley project Mad Season. Definitely worth a spin. Tags: Anthony Green, Blue Sky Noise, Circa Survive, That's right I reviewed something other than a comic book! J. Michael Straczynski. JMS as he’s commonly called. I don’t even pretend to know the dude’s name or how to spell it were it not in front of me. Everybody knows something he’s written, whether its the Spider-Man comics that erased 20 years of continuity, Babylon 5, The Changeling… Something. He’s been at DC for awhile now writing their team-up book The Brave and The Bold. 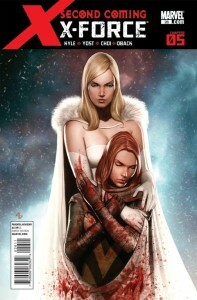 I’ve picked up the occasional issue, but while it’s fun, the book had been nothing particularly special. The stories are all told in a single issue. Cliff Chiang’s art is solid but not spectacular. Also, the fact that they’re telling lost stories plays a part in the book’s blandness… Nothing feels like it counts. 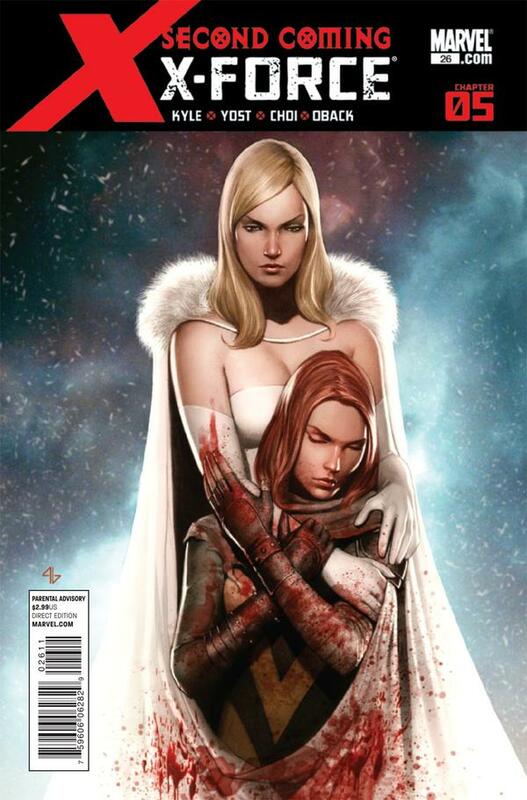 Issue 33 isn’t one of those issues, however. The issue teams up Wonder Woman, Zatanna, and Barbara Gordon as Batgirl. It seemed like an oddball team up if I’ve ever heard of one and yet somehow it was impossible to ignore. 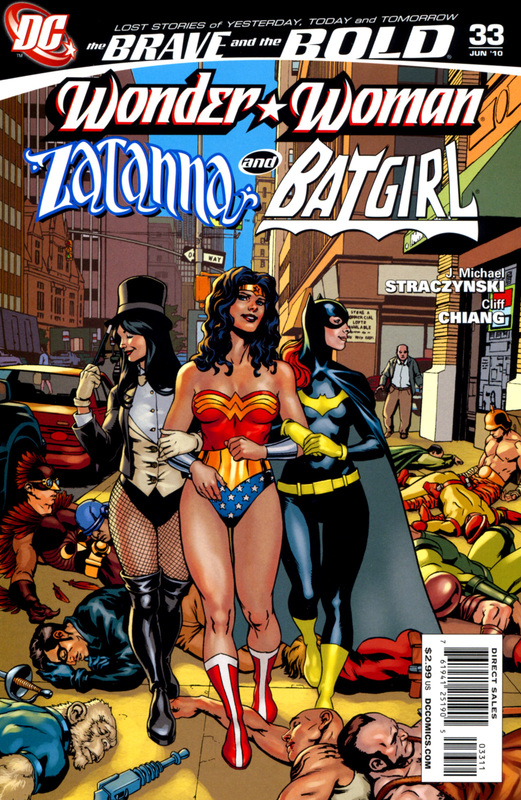 The story starts out strangely with Zatanna and Wonder Woman deciding to enjoy a night out on the town. Half-way through the second act it becomes chrystal clear where the story is going. There’s only one moment it can be leading up to… and yet when we get there the book manages to be surprisingly uplifting. I don’t know how else to say it… this issue is something really special. If JMS keeps writing stories like this, I’m on board. To the roof! There’s not a moment to lose! 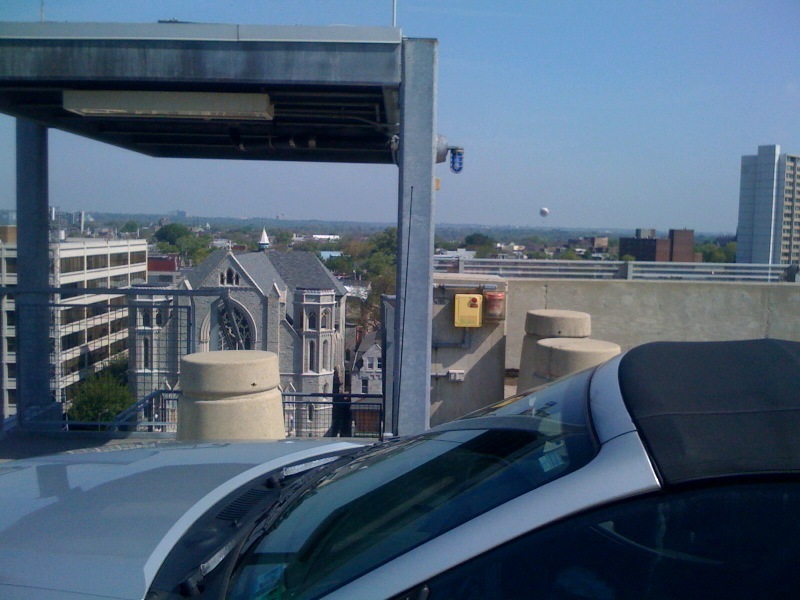 When I park in a parking garage, I’m headed straight to the roof (if available) every time. I don’t know what the allure is, maybe it just always seems like it’s somewhere I’m not supposed to be. I’m not going to lie, I think part of it makes me feel like I’m in The Matrix. Regardless of the motivation, the view is always fascinating to me and it’s totally worth driving up and down a few extra ramps to get there. Lately, I’ve been alternating between lots at Drexel University and the University of Pennsylvania. Drexel’s lot is superior in nearly every way, particularly the view. 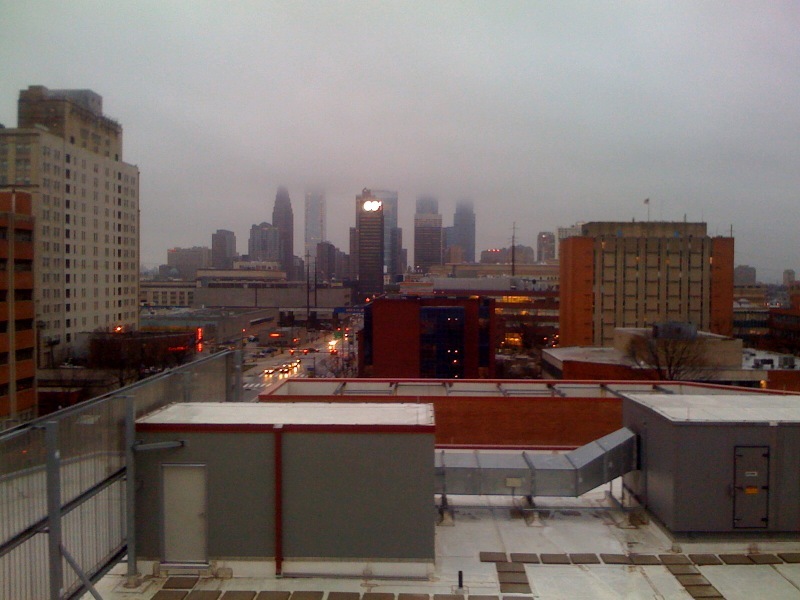 The building’s are right next door to one another, but Drexel’s provides an unobstructed view of the skyline. Amusingly, it’s a Drexel building that blocks the view of Center City from Penn’s garage. Penn Relays traffic kept both of these buildings from been available to me last week, so I took refuge in a new garage above the West Philadelphia Fresh Grocer. Upon reaching the roof I was inexplicably taken with an open stairwell to ground level. 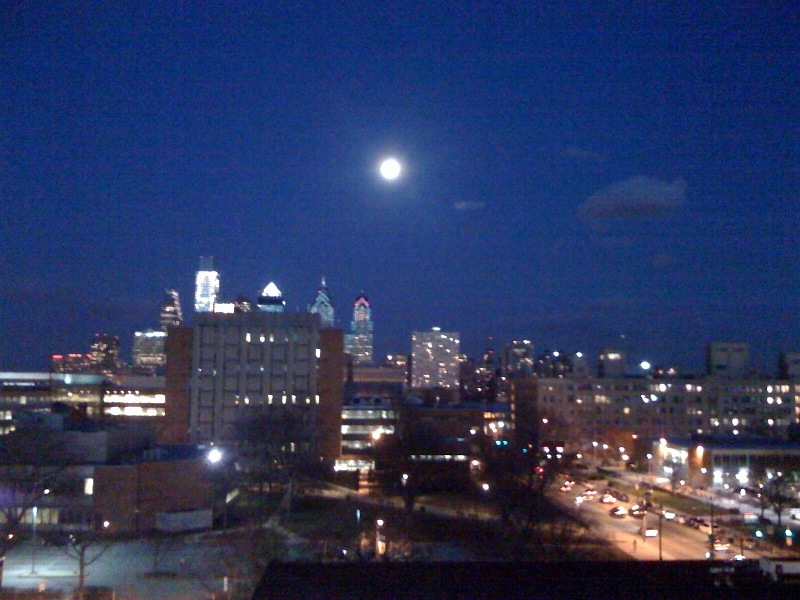 The view to the West offered an interesting perspective on the surrounding neighborhood, and the North featured the Philadelphia Zoo Balloon. This building also afforded the most Martix-like aesthetic, but it will not be part of the regular rotation given it’s exorbitant rates.